The best thing about this recipe (other than the fact that it tastes really good) is that it makes a lot. The picture only shows half of the recipe. The other half of the shells are in my freezer, waiting for their turn to become dinner. Cook the shells according to the package directions. Drain them and cool in a single layer on wax paper or foil. Meanwhile, combine the cheeses, eggs, and seasonings. Fill each shell with 1 1/2 Tbs. of the cheese mixture. Spread a thin layer of sauce on the bottom of the pan. Place the shells in the pan in a single layer. Cover with remaining sauce. Bake covered at 350 degrees for about 45 minutes or until hot and bubbly. 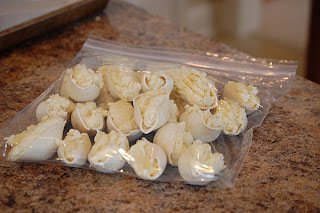 I froze the extra shells to use later in a single layer and then placed them in a ziplock bag. To use them, I’ll just assemble the shells and sauce in the pan and bake them a bit longer. Those look so good and they are freezable. Awesome job. okay…yum?….I think I will totally eat all of those…. 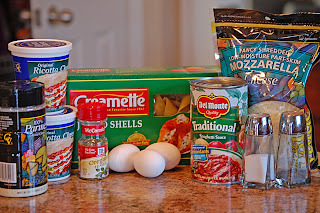 Mmmmm…stuffed shells…thanks for the freezer tip! That looks yummy. I so adore stuffed shells. Now I am craving them. I love dishes like this where you can cook once and eat for two nights. And, I’ve decided…I love that you take a photo of the ingredients all set out! Neato! ooh…yum! I’d love one now. Thanks for stopping by my blog on my special SITS day and leaving such sweet comments! I love, love, love your blog and I will definitely be back. We are trying to eat at home more and I feel like I’m always making the same ol’ same ol’. You, my friend, are a valuable resource! I am going to sit down with paper and pen and write down stuff I need to buy to make a bunch of your recipes next week! Hey, pop over to Moving Forward because I left you some “bloggy love.” You deserved it! (it’s not another award, so to speak). Thanks for stopping by my blog! Love your blog & truly admire your gifting in the kitchen!!! I'll be back for ideas, thanks for sharing!! Printed this one off to. Cant wait to add these to my menu. So, you probably don’t remember, but I commented before on your “vacation food” post. I used that idea to make meals ahead of time and take them with us on our recent vacation to the coast. 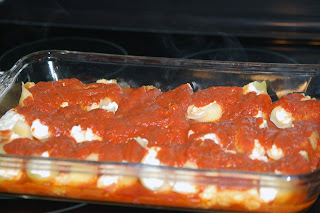 Well, these stuffed shells were one of the items on the menu and they were fabulous and oh-so-easy! I’ll definitely be making them again now that i’m at home. So, thank you, thank you, thank you!! I’m so glad you liked the Stuffed Shells and that the vacation food worked out well! Thanks for letting me know! I made this for dinner on Sunday night. HUGE hit with the family. thanks for the recipe! I just made the shells and stuck them in the freezer. I can’t wait to try them. We are preparing for baby to arrive at the end of this week so we’ve been doing some freezer meals. We made this yesterday (along with plenty to go into the freezer) and let me say, we are looking forward to when we pull the stuffed shells out of the freezer. Super easy and delicious! We had it with some garlic bread and a fresh salad. Yummy. I loved this dish. I have a time saver for you. Put the filling in a plastic zip bag and cut the bottom corner off and then pipe the filling into the shells. I love your tip about freezing the others mine now await the next emergency. Thanks for the menus. I am cooking from week 7 this week but look forward to the next menu! I made these for supper tonight, freezing the extras. They were great! Loving this website. You say that you use the cheap Hunt’s spaghetti sauce in a can, but your photo shows the Del Monte brand. I happen to use the Del Monte brand, too – however, both Del Monte and Hunt’s contain high fructose corn syrup, which makes the sauce slightly sweet. Has anyone tried this with ground beef in the shells as well? Here’s one I did with Italian Sausage and Spinach. You could do it with ground beef and skip the spinach if you wanted. i love your website. i’m actually trying to put this recipe in my fitness pal and was wondering how many servings you would say this makes. Thank you so much for taking the time to share all these wonderful recipes. This recipe serves about 12-14 people. I usually freeze some of it for later. What size box of shells are you using? I think it’s a 16oz box of jumbo shells.